"It is an honor and privilege to be passing through its life." And what a life it's had: from the practiced hands of Antonio Stradivari in his "Golden Period"; to the famous and prolific violinist Giuseppe Tartini; to Karol Lipinski, rival to Paganini and friend to the Schumanns; to the Röntgens, a three-generation family of violinists tied to the Gewandhaus Orchestra; to America, to Cuba, then to the Estonian violinist Evi Liivak, who had escaped the Nazis in World War II -- and now to Frank Almond. "The more I learned, the more I was amazed," said Frank, speaking to me over the phone from Milwaukee. "It was like a movie that you couldn't possibly have written -- it was way past The Red Violin -- and it was real. From Tartini on down, there was a real story to tell, and I felt like it needed to be told, not just because of the mystique of Stradivari, but also because it's just amazing information. And here it is, sitting in the city of Milwaukee." Frank's latest project, A Violin's Life, aims to tell that story by resurrecting pieces from centuries past that were likely played on this instrument -- some still well-known, others largely forgotten. Aided by a successful Kickstarter campaign, he and pianist William Wolfram recorded the "Devil's Trill" Sonata by Giuseppe Tartini; Violin Sonata No. 2 by Julius Röntgen; and Violin Sonata No. 2 by Robert Schumann, as well as Karol Lipinski's solo Caprice No. 3. Even the story of how Frank came to play the Lipinski Strad sounds like the unlikely plot of a novel, perhaps one called "The Stradivari Code." 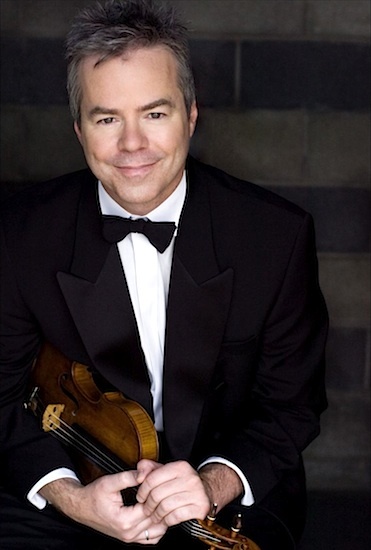 "It's still my favorite instrument story, and I've had a lot of really good instrument stories," said Frank, who has been concertmaster of the Milwaukee Symphony since 1995 (minus a few years in Europe) and currently teaches at Northwestern University. "This one was really -- shocking, in a way!" It all began with an email from a stranger: We have an old violin, left in an estate; we think it's quite valuable. What should we do with it? He'd seen this type of email before; "it happens a few times a year, somebody finds a violin in their attic or something -- it's an old story." Naturally, he was a little skeptical. "But the thing is, there were a couple of really interesting details that they happened to drop in the email," Frank said. "It seemed clear that they knew they had something really important, that it wasn't just a dumb violin up in somebody's attic." For example, they called it by its name, the "Lipinski" Strad, and all the information they gave added up: the year it was made, and the last time it was sold. He sent an email to his friend, Chicago-based luthier Stefan Hersh, who agreed, this might be for real. As it turned out, the family was in Milwaukee to take care of their relative's estate, so they met a few days later. "I met them at this storage locker, and we hit it off really well," Frank said. "They showed me old programs, old papers from Jacques Francais and insurance. It was clear that they were talking about this instrument." The Strad itself, however, wasn't there. Where was it? "It turned out that they had put it in a bank vault -- a regular bank vault at M & I Bank, which happened to be about, I'd say, 100 yards from the concert hall," Frank said. "It was ironic -- I'd been playing all the time in this hall, and there was a 1715 Strad, down the street in a bank vault!" A few days later, Stefan came up from Chicago, and they went with the family to the bank vault. "We sat in a room with a table, somebody brought in this old Jaeger case, and there it was!" It had been in the bank vault for some nine months -- safe, but probably not ideal with its extremely low humidity. Still, "it was actually in pretty good shape. At that point, it probably hadn't been played for about 20 years. It wasn't really in playable condition at that time, but there was nothing really major wrong with it. You could tell immediately that it was The Violin, just from the identifying markings -- it's hard to fake a 1715 Strad." After poring over their many options for many months, the family ultimately decided to keep the violin --- and lend it to Frank, who has experience with Strads, having played the 1710 Davis Strad (1710) while concertmaster of the Fort Worth Chamber Orchestra and the Dushkin Strad in Milwaukee. The violin, a "large-pattern" Strad, had been played by Evi Liivak, who had died in the late '90s. Evi's husband, pianist Richard Anschuetz, who had Milwaukee roots, just hadn't been able to part with the fiddle. Considering their story, one can understand why. Richard and Evi's romance blossomed in the rubble of World War II; they met at the Nuremberg Trials. She had been a child prodigy in Estonia. Her studies at the Imperial State Academy of Music in Budapest were interrupted when her father was killed by the German Gestapo. He was an Estonian patriot, and after his death, so was she, playing for Estonian refugees and refusing to play for German officers. Anschuetz, an American pianist, was working for the U.S. Army as a translator at the War Crimes Trial when they met. The two married in Paris and eventually wound up in New York City. Their life with the Lipinski Strad began when Anschuetz's mother, Rosalind Elsner Anschuetz, bought it for Evi's use from the Wurlitzer Instrument Company of New York in 1962 -- for $19,000! (One can only ponder what it would collect now -- millions, no doubt!) Though she was never a huge name, Evi Liivak toured some 35 countries, playing recitals and concerts with the Strad. But where was the violin before that? "There was a family in Cuba that owned the instrument from the 1940s until the early '60s," Frank said. He learned more about this several years ago, when the son of that owner tracked down Frank after a concert he played in Florida. The owner "had literally escaped Havana in about 1961 -- he sort of saw the writing on the wall. He wound up in Florida, where he sold the instrument because he had to start over. He basically escaped Cuba with the instrument and his two daughters. He was the last person to own it before it was sold to the current owners." "Well, remember that Havana was a very culturally aware place, with a long history of classical music, up until the early '60s," Frank said. "The son was a violinist, he was taking violin lessons, his father bought the violin as an investment in the 40s, from Wurlitzer." The owner was a supporter of the Havana Symphony, and "when soloists would come through, they'd come over there and he'd show him his instruments." The son showed Frank a card with the years and the names of everybody who had come over to the house to play the violin. How many violinists were on that list? "At least 15 -- 15 of the most famous violinists I'd ever heard. It was amazing. He specifically remembered that Heifetz played on the instrument for a little while and thought it was too big. He didn't like the fingerboard -- said he wasn't comfortable playing on it!" Among the other names included Nathan Milstein, Isaac Stern, and Michael Rabin. But we're just scratching the surface, here. Let's crank up the way-back machine and go back to the early 18th century: this instrument was first owned by Giuseppe Tartini, the colorful Italian who dodged life as a priest to become a violinist whose most famous work is arguably the "Devil's Trill" Sonata, which Frank plays on the album. Tartini's pupil, Signor Salvini, inherited the fiddle and gave it to Karol Lipinski -- and that's also a heckuva story (well-documented but possibly a bit exaggerated). As Lipinski related to a friend: Upon hearing Lipinski play for him at his house, the elderly Salvini smashed Lipinski's violin to bits. He then offered him his teacher's Strad, the beauty which he said could be best unlocked by Lipinski's hands. "Lipinski was incredibly famous, and a prominent cultural figure in the 19th century, even though a lot of people don't know who he is now," Frank said. "He was very close with the Schumanns, he had a long history with Ferdinand David and Mendelssohn." He also played a number of public duet contest concerts with Paganini. Of course, we've all heard of the 24 Caprices by Paganini, but how about the Caprices by Lipinski? Frank plays his solo Caprice No. 3 on A Violin's Life and he admits that it was both hard to play and hard to find. "Lipinski came from that sort of virtuoso tradition; there was a reason he was up there with Paganini, playing those little contests," Frank said. "He was a fairly prolific composer himself, certainly not as much as Paganini, but definitely from the same philosophy. Nobody's going to lump Lipinski in with the Hall of Fame composers of the last 200 years, but I thought it was a nice little piece for solo violin, and I thought it was representative of that tradition and his work." Frank found the music through a student who was playing it on YouTube, but also "you can still get a lot of this music from the Karol Lipinski Academy in Poland, in Wroclaw." Frank included Schumann's second Violin Sonata in A Violin's Life because "Schumann and Lipinski were very close. He and Clara and Robert played quite a bit of chamber music together, and my guess is that they almost certainly played this sonata, on this violin, with either with Robert or with Clara at the piano." After Lipinski died, the violin found its way into the Röntgen family of Leipzig, Germany. Engelbert Röntgen played this violin as concertmaster of the Gewandhaus Orchestra from 1853 to 1897 -- a crucial time and place in the history of Western music. "We did the math and realized that this was the violin the concertmaster was playing for the premiere of the Brahms Violin Concerto, with Joseph Joachim standing 10 feet away with his 1715 Strad," Frank said. "There were tons of those stories. It was also the violin being played for premiere of the Brahms Double Concerto, with Brahms conducting." One of the most interesting pieces Frank plays on this CD is the Sonata by Engelbert's son, Julius Röntgen. "Nobody really knows who he is any more, but he was extremely prolific; he wrote hundreds of works," Frank said. Finding even one of those works required a some detective skills: "I started at the Northwestern Library. There were copies of various sonatas around, but nobody would loan them out because they were in places like the Vienna State Library or in Amsterdam, and most were out of print." Finally he found a copy of the violin sonata at Juilliard. "It was really something, to sit in a room with Bill (pianist William Wolfram) one day and read this music through, because, for sure, nobody had read that piece in probably 80 years," he said. "Certainly nobody had performed it --it was totally out of print. So we thought it would be great to record it. Bridging the Röntgen era to the present, "there are several decades of this century that we left out of the project," Frank said. "Maybe that's a future project." And the future of the Lipinski Strad? Frank has everything to do with that. Is he haunted at all, by the extraordinary history behind the fiddle that is now his constant companion? "If you start thinking about everything behind that instrument, it's easy to feel quite tiny!" Frank said. "Sure, it was creepy to play the 'Devil's Trill' Sonata for the first couple times. But that's what the violin is for: playing. It's going to be here a lot longer than I am, and every day that I'm able to play on it, to me, it's amazing." Are there any recordings of Evi Liivak's playing? I could not find any on Youtube. May 11, 2013 at 05:16 PM · A wonderful story, thanks for posting! May 11, 2013 at 08:27 PM · Elise, I put this question about Evi Liivak to Frank, and he said that he's heard some old tapes, but there is nothing commercially available, at least not at this point! May 12, 2013 at 12:47 AM · A violin's life: what a great title. And to think much of ITS history was gathered up from all over the world and placed into the hands and mind of Mr. Almond. You lucky son of a gun. May 12, 2013 at 05:08 PM · Thanks Laurie - I wonder if there is some way I could hear a snippet. Not sure why but I just feel I need to hear her play... Preferably a slow passage. May 15, 2013 at 03:34 PM · So amazing. May 15, 2013 at 04:53 PM · As interesting as this story is, wouldn't it be great to have a decent recording of the instrument rather than this "bathroom" with video. It's quite impossible to get any idea of the possibilities or tonal range of this violin as it stands, especially as huge amounts of 20st century digital reverb and a whopping 19th century vibrato have been superimposed over something no doubt Tartini would never have dreamed of doing. The people who did this video. Thanks for your comment, and maybe I can clarify a few things. First, there are two excellent modern recordings of this instrument, one of which is the subject of Laurie’s interview above. The other is called “Portraits and Elegies” on the Innova label, and is more modernist in terms of repertory. Regarding the video above (not associated w the new CD), the idea was that several years back, an arts website thought the Tartini connection was compelling, and basically wanted a video to accompany both the story they were running and a concert we had coming up. The sound in the room was definitely reverberant but not digitally manipulated; we were sort of doing our best to get a decent sound that would most likely be heard through someone’s computer speakers. That’s in contrast to the commercial recordings I mention above, both recorded at a very different venue (several years apart) and I think both quite representative of the instrument’s genuine sound and capabilities (in my hands, anyway). As for what Tartini would think of vibrato, a different neck, hardware, metal strings, etc. that’s difficult to know for certain. You’re obviously aware of his somewhat curious and innovative personality, documented in great detail on the “Tartini” link embedded in the interview. In any case, we weren’t attempting any kind of historically authentic interpretation, since it’s fundamentally a different instrument now, we were using a piano, and there are lots of other artists who specialize in that sort of thing. But we did enjoy a sort of hybrid approach that distinguishes the Tartini from the other works on the CD. I hope you’ll listen and find something intriguing, maybe even enjoyable. Thanks again for your comment. May 15, 2013 at 08:16 PM · Indeed it's very interesting to get a reply "from the horse's mouth" as it were, and where you put a little more context on the video. I hope you don't mind a number of comments here. I'm very interested to see you do underline the idea, the instrument today, in fact is very different from the way Tartini would have found it. That's rather an important proviso, and something which should be said time and again to the unwary. , and the instrument today will have much higher tension, with modern strings, than all those years ago, I would be extremely interested to be able to hear the difference in some kind of back to back test....like the way back time machine. How could we actually demonstrate in some way what these "may" have sounded like, with an A down at 430 or so....etc etc. I would say that is, really properly recorded with coincident techniques, and a proper engineer, well it would not be easy. I think the evidence has shown again and again, in blind tests, even well trained musicians are quite incapable of distinguishing a Strad from a modern instrument, & often marked them down against a new modern instrument, never mind the public who have just been media fed to look at the $$$$ numbers game. You know where this led us. You know this, as well as I do. To come back to the tonal qualities, and evaluating them, is really a non trivial task, which is why recording is so difficult, and sound propagation is the key to doing it right. I would love to do such a test with such an instrument, and then back to back against say a Guarnerius. This is of more than passing interest, because I also believe the way we are playing these pieces is as much the result of "fashion" as well as Tartini,- "what we might he like to have done if he had been Orson Welles...."
You have probably heard and been inspired by the late Ricci's "Violins of Cremona" recording, with all the defects that were present using tape. It was a long time ago now, and nothing like it has ever been done since. However, each instrument really could be heard even then to have quite distinct colouring, and again they were all set up "modern" as well as with Ricci's unique playing style. Caveats...so many of the points I already made here. Are we actually doing anything valid at all, when people simply can't tell the difference, and most musicians can't even hear the difference between 440 and 442. The primary resonant tones of a modern violin today, can be at a completely different pitch to the key the composer originally wrote the music for.